Freeport, Illinois – Where City Officials Believe Deer Can Read! Freeport, Illinois is a city where deer run rampant, and the city administration, council members, and city employees have done nothing for years. A few years ago, the City spent $50,000 to beautify certain areas of the City. What a joke! The deer have done hundreds of thousands of dollars of damage to residential properties in this City. The City has grants for sidewalks and façade improvements. The time has come for grants to reimburse citizens for deer damage. I guess I did forget that the City has done something about the deer in the City. 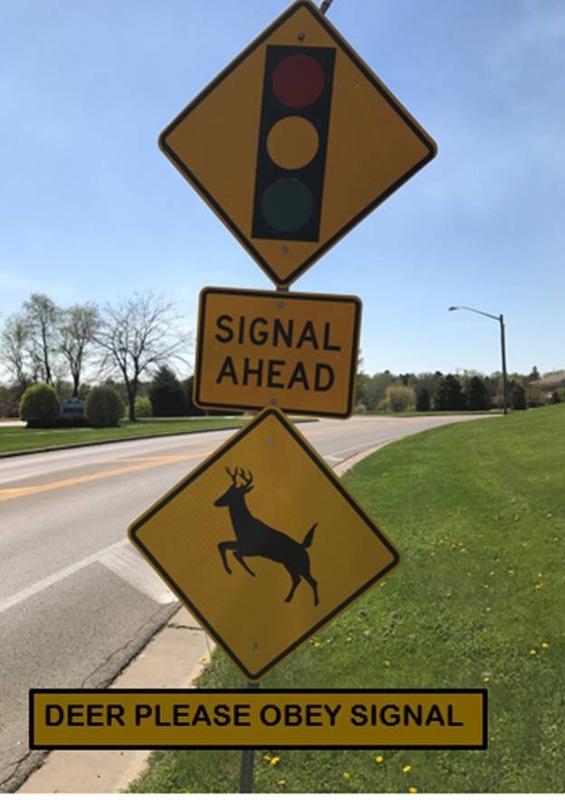 The City has posted “deer crossing signs” such as the one on South Street right before Burchard! That is as stupid as the City’s do nothing deer policy. Maybe the deer are smarter than City officials, and the deer can read. Then the solution to the deer problem is simple. The City can furnish residents with signs with the following message: Attention All Deer – Please Do Not Eat My Shrubs. Now for the sad part – there are City officials who believe that is a reasonable solution. This entry was posted in Uncategorized on April 26, 2017 by Good Day Illinois. 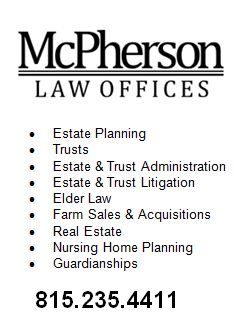 Heather McPherson of McPherson Law Offices, Freeport, Illinois will be speaking to Illinois lawyers on April 28 in Chicago at the annual Illinois State Bar Association Elder Law Bootcamp Course. Her topic is Trust Administration. Heather is past chairperson of the Illinois Bar Association Elder Law Section Council, and is member of the Trusts and Estates Section Council of Illinois Bar Association. She is frequent speaker at Bar Association sponsored programs, and also speaks to community groups on various estate planning topics. This entry was posted in Uncategorized on April 24, 2017 by Good Day Illinois. Freeport, Illinois Leads the Way – Undocumented Dogs Will Be Dealt With! Alex Mills, Community Development Director for the City of Freeport, has again taken the lead in proposing a new ordinance to deal with the problem of undocumented dogs within the City of Freeport. He has proposed that all dogs be registered, and a DNA registry be established for all Freeport dogs. If residents find dog waste in their yards, they only need to drop off samples of the waste at City Hall. They will be sent to a laboratory for analysis. If there is match to a dog in the registry, the owner will be notified and fined. If there is no match, the problem will be referred to the police department to investigate. Unfortunately, the Freeport Police Chief has already stated that his department is too busy to deal with undocumented dogs, and that he will not enforce the law. Mayor Gitz says that the refusal of the Police Chief to enforce the law should be referred to the new City Manager. This entry was posted in Uncategorized on April 18, 2017 by Good Day Illinois.